A recipe for vanilla frozen yogurt made with Greek-style yogurt. It is a lightly sweetened and tangy frozen treat with the simple flavor of vanilla. Combine the milk, sugar, and gelatin in a saucepan. Set stand for 1 minute. Cook over medium-low heat for 5 minutes or until the gelatin dissolves. Let the mixture cool completely to room temperature. Stir in the yogurt and vanilla. Cover and refrigerate for 8 hours or overnight. Pour the mixture to an ice cream maker and freeze according to the manufacturer's instructions. Transfer the frozen yogurt to a freezer safe container. Enjoy immediately for soft-serve consistency or freeze for at least 2 hours. If frozen hard, let it set out for a few minutes to soften before serving. 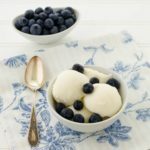 A recipe for vanilla frozen yogurt made with Greek style yogurt. It is a lightly sweetened and tangy frozen treat with the simple flavor of vanilla. Time doesn't include freeze time.